Do you need extra help for EL students? Try the Picture StrategyPre-lesson. Students will be able to write and solve subtraction equations that match subtraction drawings. Tell students that we are currently in the season that falls after winter and before summer. Ask students to guess the season (spring) and tell you some things that come to mind when they think of spring. Explain to students that today we are going to look at a variety of spring-themed pictures and use them in a maths lesson on subtraction. Provide images of the different seasons and associated vocabulary words in students home language (L1). Have students pair share ideas with a peer using the sentence starter, "In the spring I think of ____." Tell students that today we are going to be looking at spring-themed pictures to write subtraction equations. Ask for a student volunteer to tell you the different parts of an equation. Support students to understand that the parts of an equation include two numbers, a minus (or take away) sign, an equals sign, and the Difference, which is the result you get when you subtract one number from another number. Draw on the board: six flowers, a minus sign, two flowers, and an equals sign. Tell students that they can read this as, "Six take away two equals ____." Call on a volunteer to solve this problem. Ask for a second volunteer to write out the equation that matches the picture (6 - 2 = 4). 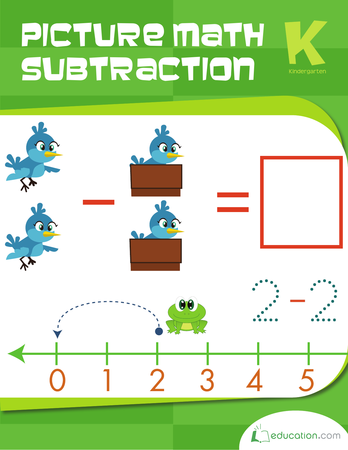 Display a visual of a subtraction equation and review each part while pointing to it. Model solving the sample equation before asking for a student volunteer. Have students pair share with a partner how to solve a second problem. Draw a variety of spring-themed picture maths problems (e.g., five rabbits, a minus sign, four rabbits, and an equals sign) on the board. Call on students to come up to the board to practise writing an equation that matches each set of pictures. Review students' equations as a class to ensure that they have all of the necessary parts of an equation and that they correctly match the pictures. Invite students to share with a partner how to solve the problem before trying it in front of the class. Provide students with sentence starters to use when explaining how they are solving the problem. For example, "First I ____." 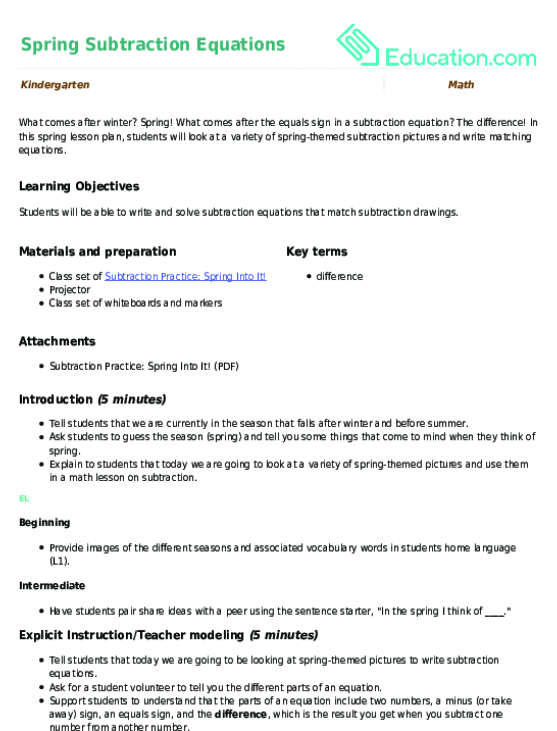 Project the Subtraction practise: Spring Into It! worksheet onto the board. Tell students that they will be completing this worksheet independently. Ask students to move through each set of pictures, find the difference, and write a number equation underneath the pictures in each row. Hand out the Subtraction practise: Spring Into It! worksheet for students to complete independently. Model how to complete the worksheet by displaying it on the board or projecting it. Have students repeat instructions back to you. Ask for a student to restate the directions in their own words. Provide maths counters for students to use as needed. Provide students with manipulatives (e.g., unifix cubes or counters) or scratch paper to assist them with solving the subtraction equations. Create an equation template (e.g., ____– ____= ____) for students to use as they are writing equations during Independent Work Time. Provide students with lined paper to write their equations if they have difficulty writing underneath the pictures. Challenge students to create their own, more challenging, subtraction picture worksheet. Tell students to draw a variety of subtraction pictures using larger quantities and exchange them with another student also needing a challenge. Distribute whiteboards and markers to each student. Draw a subtraction picture on the board and tell your students to write an equation that matches the picture. Tell students to hold up their whiteboards after writing their equations so that you can check their work. Write a subtraction equation on the board and ask students to draw a subtraction picture that matches. Tell students to hold up their whiteboards after drawing their pictures so that you can check their work. Continue with at least two subtraction equations and two pictures. As students are showing their work, check that they understand the difference between subtraction/addition and equation. Collect work samples and assess if students were able to read the equations and complete accurate representations using pictures. Call groups of students to the front of the classroom. Say a subtraction problem that will incorporate all of the student volunteers. For example, "Six take away two equals ____." Tell the group of students to separate themselves so that their bodies are representing the different numbers in this equation (i.e., one group of six students, one group of two students, and one group of four students to represent the difference). Continue this activity with at least three more equations. Model how to complete a subtraction equation using acting. Have students pair share with a partner how to solve the equation before having volunteers seperate. 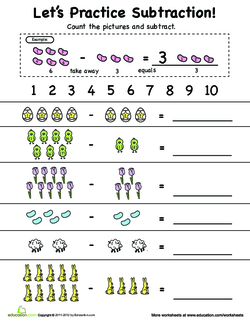 In this spring lesson plan, students will look at a variety of spring-themed subtraction pictures and write matching equations. This can be used as a stand alone or support lesson for the Spring Subtraction Equations lesson plan. Start off subtraction with some picture equations, perfect for helping your child understand a new maths concept. Help her by practising simple subtraction equations. Can you use these pictures to help you solve the subtraction equations? Use these fun toy themed maths problems to assess your students’ ability to solve addition and subtraction problems within 20. Learn subtraction in a more visual setting using this series of picture maths problems. Kids will cross out, colour and draw simple equations to help them understand an important maths concept. Use these fun fruit and vegetable themed maths problems to assess your students’ ability to solve subtraction problems within 20.